It took seven games, but the St. Louis Blues have dispatched the Chicago Blackhawks. 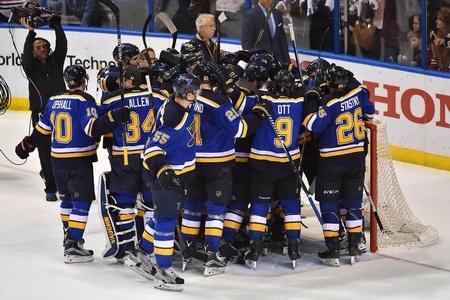 The Blues took the Game Seven victory on Monday, wrapping the series with a 3-2 final score. St. Louis had goals from Jori Lehtera, Colton Parayko and Troy Brouwer, while Marian Hossa and Andrew Shaw had the goals for the Blackhawks. Chicago led Game Seven in shots on goal and they were more effective in the faceoff circle and on the power play, but the Blues buckled down and played a physical, gritty game to snag the victory. St. Louis hasn’t advanced to the second round of the playoffs in four seasons. They defeated the San Jose Sharks in five games in 2012, only to lose to the Los Angeles Kings in four straight. Chicago actually outscored the Blues in the series (20-19), although Jonathan Toews didn’t score and Patrick Kane found twine just once. Andrew Shaw had six points in six games, including four goals, and Marian Hossa had five points in seven games. The Blackhawks also received scoring from Duncan Keith and Artem Anisimov, who had three goals apiece. Artemi Panarin, the 24-year-old Russian, had seven points in his first seven playoff games. Chicago goalie Corey Crawford went 3-4 in the series and posted a 2.54 goals against average with a .907 save percentage. As for the Blues, Vladimir Tarasenko had four goals in the series and managed six points. But he remained the subject of some controversy, with an “outburst” on the bench with head coach Ken Hitchcock making headlines after Game Six. It was more of the same in Game Seven and Tarasenko was putting in short shifts. He put in just 14:31 of ice time on Monday and saw his ice time limited throughout the series. Regardless of any Tarasenko conflict, St. Louis still put together a well-rounded performance. Jaden Schwartz had seven points in seven games, including three goals. Defenceman Alex Pietrangelo had six points in seven games, while centre Robby Fabbri was good for five points. David Backes and Parayko had two goals apiece. Netminder Brian Elliot weathered the Chicago storm and posted a 2.40 goals against average with a .929 save percentage. He earned the shutout in Game One. In the end, St. Louis edged out the Blackhawks by playing a depth game and containing the opposition. While they were outscored by a hair, they stuck to the plan. They’ll have to be better in the second round and Hitchcock and Tarasenko will have to sort through their business, but the Blues remain a dangerous team nevertheless.